There was a discussion recently on a closed Facebook forum for members of the Alliance of Independent Authors as to whether it was possible to typeset your own book, or whether you should pay someone else to do it for you. What was interesting was how many indie authors admitted this was the one area they wouldn’t touch with a barge pole, despite having a ‘do it yourself’ attitude to most self-publishing tasks. Then there were the die-hard enthusiasts like me, claiming it is easy – all it takes is a little knowledge of Word and a willingness to devote yourself to the detail. 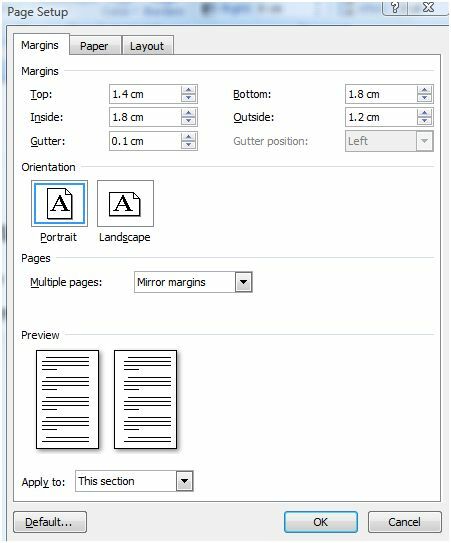 Having just finished typesetting Murder at the Maples ready for print, I’ve produced the following guide to typesetting your own book in Word. You can also download my template, which is ready for you to drop your own text, title and name straight into. This template is set to the same size and other parameters as my books – 5×8 inch trim size, generous margins and line spacing – but you can adapt it to suit. What’s perhaps most useful is that some of the hard work is done for you, for example getting the page numbering to start at 1 on what is, in effect, page 7 was something that took me quite a while to work out! Feel free to ask questions about the guide or template in the comments box below, and I’ll update this guide as and when I learn new ways to improve the template or the process. Happy typesetting! 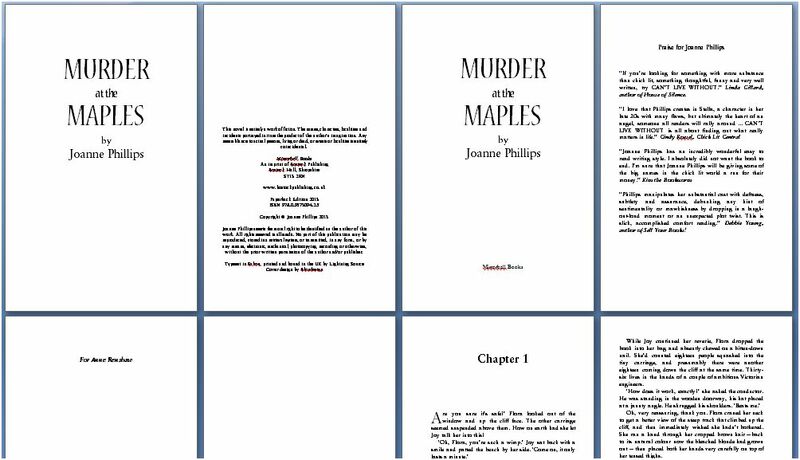 Screenshot from typesetting Murder at the Maples. I really love this process – it’s so satisfying! First of all you’ll need to open the template. Click here to download it. Also open your final, proofread, perfect version of your book. You REALLY do not want to be making any text changes after typesetting your book, so don’t even think about doing this until it’s as perfect as you can get it. Above you can see the settings for margins and orientation. 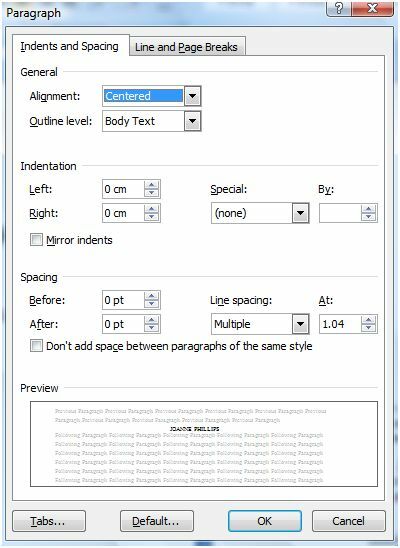 If you want to alter your existing Word doc instead of using a template, you can use these settings as a guide. Don’t forget Mirror Margins. This is what will make your recto and verso pages sit together as mirror images. Don’t know what recto and verso mean? Read on. The next tab shows you the settings for Paper. This is where you’ll need to change the size if you are not going for a 5 x 8 inch trim. Ignore the other options here. Un-check different first page if it’s checked. You’ve now got your document set up as a book. Yippee! Now it needs some text. Ignore the title pages for now and go to first page of the text of novel (numbered page 1 in the template, with Chapter 1 at the top) and copy and paste your text into here from your proofread master copy. Select all the body text (but not preliminary title pages, so you’ll have to do this manually and not with Select-All) and choose the font you wish to use for your book. I use Sabon, which can be downloaded, along with many other professional fonts, at Dafont. Don’t worry if your book has different fonts or styles within the text – changing the font should not lose any italic or bold formatting (although we will check this later), and you can change specific sections on your final check-through. With all the body text selected, click on the arrow for Paragraph in the top toolbar. As in the image above, you might find the alignment changes to something like Centered – you don’t want this, so change it now to Justified. Outline level should be Body Text, and then follow the settings in the box above. Indentation, none. Don’t add space between paragraphs should be unchecked. Under line spacing, select multiple and type 1.04 in the ‘At’ box. NB: Play around with this to find the line spacing you like for the font you are using. For Sabon, my personal favourite, 1.04 works well but it may not be as effective for other fonts. 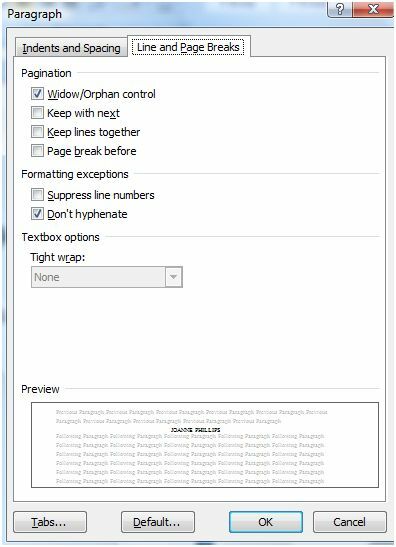 For Line and Page Breaks, only click Don’t Hyphenate, leave Widow and Orphan control unchecked. You will do this manually, but if Word does it for you, you won’t have even text on each page. Trust me! Put the first chapter title into the style you like, select it, then right click on it and go to Styles and choose ‘Save Selection as New Quick Style’. Give it a name, like Chapter Heading. Do the same for the first paragraph (no indent) and second, or body, paragraphs. Now these new styles should show up in the box called Styles, and you can simply select your text and choose the new style. NB: A word about styles and consistency. Many people think typesetting your own work is really difficult, but clearly it isn’t. What it takes is a small amount of knowledge of Word (or whichever software you are using) and the willingness to spend time making it uniform. Using styles means that if you suddenly decide to make your chapter headings a bit bigger, or make them all italic, all you have to do is modify the Chapter Heading style once. That’s right – once only, and all the chapter headings in your document will change. If you choose to ignore using styles you’re making a lot more work for yourself and run the risk of not having a consistent design flowing all the way through your book. Now it’s time for the fine-tuning. With your master document open alongside, double check all italics and bold text are intact. Check for windows and orphans – basically just words left alone on one page at the end of paragraphs or sections – and adjust as necessary. If you want drop capitals at the start of your chapters, select the first letter, click on the Insert tab, and you’ll see the button for Drop Cap right there. Easy! Reverse of this: Blank or ‘also by this author’ or reviews/praise. Seventh page: Chapter One or Prologue, numbered as page 1. Don’t forget to add end-matter too. An Acknowledgements page is included in the template, but you can have any number of material at the end of your book: also by this author lists; an excerpt of your next book; notes on the text; or book-club questions. Can’t Live Without was all about a list, and at the end of the book I printed a blank ‘Write Your Own Can’t Live Without List’ section, which I thought was kind of fun. Remember every extra page will eat into your profit, though, so don’t get carried away! That’s pretty much it, to be honest. Once you’re happy with the layout, save your document as a pdf ‘standard for publishing online and printing’. View the pdf in the Two Up layout, so you can see what the printed book will look like with the recto and verso pages together. See how the margins allow for the gutter in the centre of the book so you can read the text nicely without having to break the spine? Make sure the numbering works, check chapter headings are consistent – well, you know what to do. Check, check and double-check. And then check again. When you’re happy, you have the interior file for uploading to CreateSpace or Lightning Source, or whoever you’re printing with. Good luck! 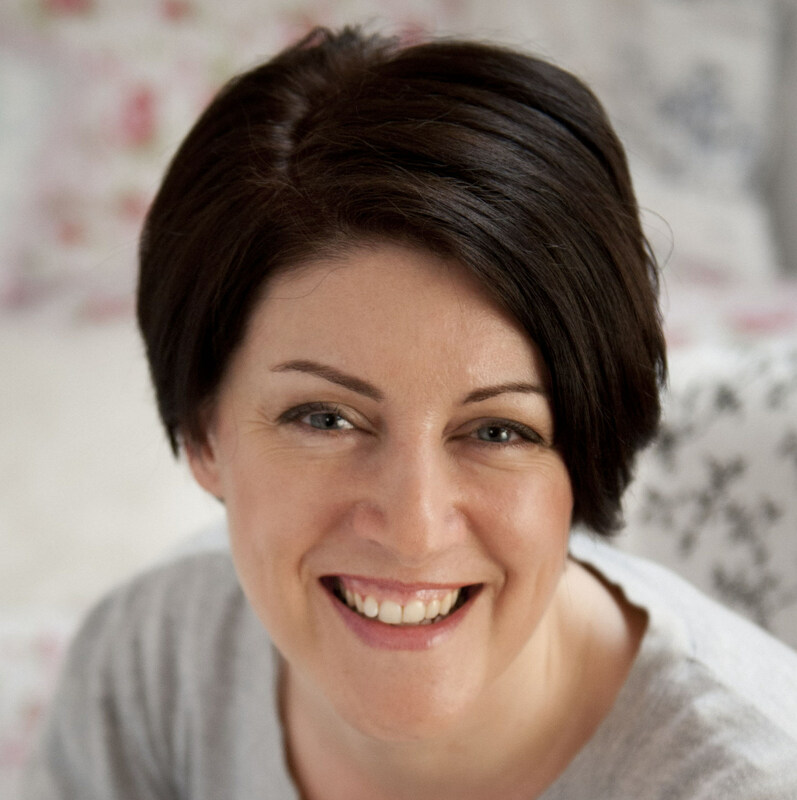 A great post, Joanne – brings back memories, I must say! I formatted both of my children’s books and felt very proud with the final results! (Especially when Waterstones said “These don’t look self-published!”) However I did have an ‘expert’ check the final PDFs for me for a small fee before upload, just for peace of mind. I think children’s books must be even harder to format, as there are obviously different requirements for the text on the page. I’m afraid I haven’t come across a fix for the gaps – I know dedicated typesetting software would sort this out automatically, but in Word, as you said, you just have to go through it manually and add extra spaces, or move words to another line, to sort it. Working my way through this RIGHT now, and finding it so incredibly useful, thank you! Hi, Joanne! I’m using your lovely guide again for the second in my series, and for some reason this time it’s doing something odd when I paste my text into the template and all my lovely, carefully-placed drop-caps are going skewiff! Didn’t happen last time, and I’m wondering if I’ve missed out a step … any ideas gratefully received if you get a minute! Dear Jo, this is a fabulous tool and thank you so much for sharing it. It would have taken me ages to put something similar together. Just one query, the title page seems to be on a verso page. Shouldn’t this be on a recto page? So glad you’ve found it useful. The title page will be recto when the book is printed, it’s the first page inside the cover so it’s on the right. Then the copyright page is on the reverse of this, and so on. Thank you so much for your prompt response. Understood. Me again. I have some images I want to include in my manuscript but have been told that if these are embedded in Word, the reproduction is awful. Would you know anything about this please? 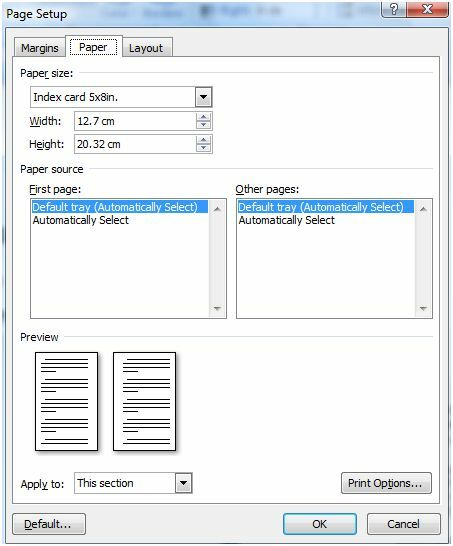 Hi Tamsin, I think as long as you insert high quality jpegs into the document and remember to select the pdf option for standard size suitable for printing it shouldn’t be too bad. You’ll be able to tell anyway once you’ve produced the pdf – if it renders badly on screen then it won’t print well. This is one situation where using CreateSpace to upload your files and get a proof – no cost to upload and only pay for postage- is worth it even if you’re not planning to use CS for the final book. Gives you chance to see how it prints with low outlay. Another really helpful and prompt response. I’ll give it a go and post the results as a comment for your other authors to use. Sorry to be a pest Joanne but I finally have my manuscript completed including images in Word in A4 but when I copy and paste into your template, the images don’t automatically resize and spill over the right margins. Any advice gratefully received. Thank you again for your prompt response Joanne. I will try this out and also see if there is an easier way. If I find one I’ll pass it on. I really do appreciate your help. Oh my word… this is the best find on internet I have ever discovered. Having my book with the editor for final changes, I started to look in a panic for typesetting software. Only knowing Word I was in a total fluster and your post came to my rescue. I intend to self publish on Amazon for the eBook, but as I want to add photos for the printed version I need to find something to which I have a little knowledge. This post is a God send, thank you. Wow this was a great find and can only be of help for those who want to have their own books printed. An excellent starting guide, indeed. I have followed a long learning curve with formatting novels in Word, and find the trickier parts come in with correctly setting mirror margins, outside page numbering, the table of contents, title as a verso header and author on recto, no header in chapter heading pages, dropped capitals and the like – but all of them can be mastered. One reads that it can be spotted that the spacing of words and letters isn’t ‘professional’ if done in Word, but I feel Word does a good enough job. Excellent post. Word requires a very long learning curve when it comes to formatting for print… The problem with most word processors is that they haven’t been built to write books, they’ve been built to write anything and everything, so they don’t easily cater for professional typesetting.